Spring on a college campus usually means studying outside, frisbee on the quad, wearing shorts to class, and weekend grilling. So even though the temperatures are still in the low fifties up here in Maine, my friends and I have pulled out our grill in anticipation of barbecue season. It seems like grilling is usually left to the guys and this rings true in my family too, which may explain my less-than-stellar barbecue skills. In the summer months the stove at my house gathers dust and my dad can pretty much always be found outside at our snazzy new gas grill. He makes a mean grilled pizza (yep, it’s not only possible, it’s delicious) and has some really creative warm-weather recipes for the barbecue. So, I called in to my resident barbecue expert for this article, and my dad came through with a recipe for grilled shrimp with mango and papaya. Since I’m not big on burgers and hot dogs, I love trying my dad’s more unusual grill masterpieces. The flavors in this one are great for summer and it’s super healthy, too. Plus, it seems a lot harder than it is, which makes it a great way to impress your friends with some creative grilling recipes. Katharine spent her junior year indulging in delicious food (and doing a little studying) in Lyon, France and Bologna, Italy. Back home, she loves cooking Ina’s Perfect Roast Chicken. This recipe is also great served over greens (I like arugula). 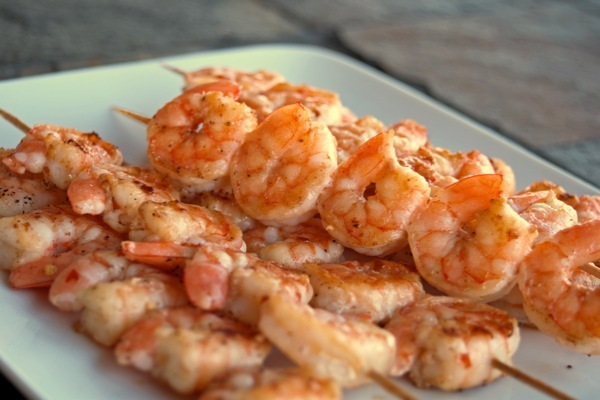 The longer the shrimp marinates the better, so be sure to plan ahead. In a medium bowl, combine the soy sauce, garlic, ginger root, sesame oil and lime juice. Add the shrimp and let them marinate overnight, or for at least three hours (in the fridge, of course). When you are ready to grill, peel the mango and papayas and cut into 1 inch cubes. Skewer the marinated shrimp and the fruit cubes. Keep the fruit towards the middle and shrimp on the outside of the skewer since the fruit tends to take longer to cook. Place the skewers on the grill (low heat is better) for about 3 minutes on each side, or until the shrimp is pink and cooked through and the fruit is nice and warm. Serve alone or with greens.